Your place for course news and announcements! Students, please take a moment to complete the course survey by Friday, July 12th. We use your feedback to help improve our school. You can locate a link to the survey on the Home Page of D2L. STUDENTS, check your personal email accounts for important EOCT information. Visit our website for specific information regarding your testing site. http://www.gavirtualschool.org/CourseInfo/EndofCourseTestInformation.aspx Please understand our testing centers are at capacity and we cannot change testing dates, times, or locations. Calculator information is included in the attachment below. If you have questions contact mkrueck@doe.k12.ga.us. Good Luck on your End of Course Test! The deadline to get all extra credit submitted in USA TestPrep is Monday, July 8th by midnight! Below is the information again on how to access the extra credit assignments. I have created a few bonus assignments for those students who wish to improve their grade! 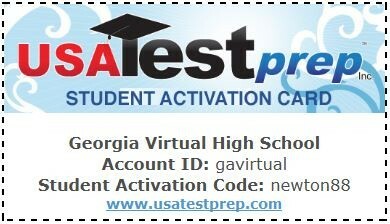 In order to access the assignments you must create an account for USA Test Prep. Below is the information you will need to create an account. Once you have created an account, I will add you to the class I have created and you will find the assignments. For those of you who already have an account with USA Test Prep, I have already added you to the class (Hague Biology). The Video Bonus Assignments will grant you 10 extra credit points on the test that it corresponds to in our course (a grade of 80% or higher is required). The EOCT Practice Tests will replace your lowest project/test grade (There are two of them!). Once you have created an account, email me so that I can add you to the USA Test Prep class that I have created (Hague Biology). All extra credit assignments must be completed by Monday, July 8th at midnight to receive the extra credit.